Krüst Bakery sells the World Famous Cronut in Dublin! What do you offer at Krüst? We offer a wide range of products at Krust Bakery from donuts, luxurious Cronuts, pastries, gourmet sandwiches on freshly baked breads to our delicious Marley Coffee. Our signature product is the 'cronut' pastry - a unique creation invented by Chef Dominique Ansel from NYC that is classed as a croissant-doughnut hybrid. After its launch on May 10, 2013, cronut fans spanned the world from Berlin to Singapore, making it the most viral dessert item in history. 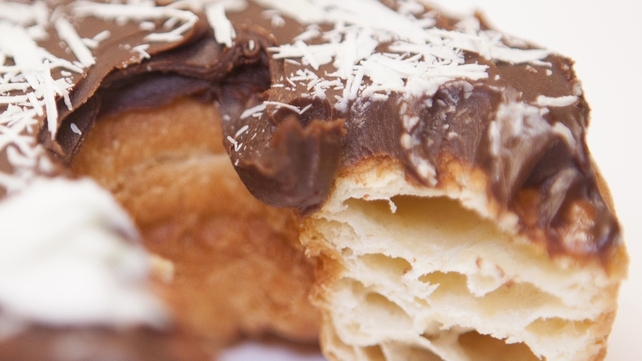 The cronut has now become one of the most popular desserts in the world. One reason it has become so popular excluding the fact that it tastes so good is down to the fact that it's hard to make, making it rare and a "must have" when found! The Cronut take three days to make, thanks in part to the laminated dough. This is rolled together with a block of chilled butter to form layers, and needs a lengthy rest in the fridge. Two days before you’re allowed near the fryer, you must make a dough square. On day two, you get the dough out of the fridge and roll it with a perfect square of butter made using parchment and a ruler. Then back in the fridge it goes until day three – a frenzy of frying, glazing, flavoured sugar and piping work. The equipment list specifies a stand mixer with dough hook, the ruler, piping bags and a deep-frying thermometer. Cronut’s do not discriminate! Students, professionals, tourists and teenagers all enjoy the magic. We provide Catering now across Dublin which is a big plus for anyone around Dublin that would like some sweet treats or specialty sandwiches to showoff or impress during an event.